Unlocked at level 40, Decathlon can be found in the Fortitude menu, next to the Battlefields, Arenas, and Team Instances. The game offers 2 modes for entering Decathlon – Normal and Hard. The selection will determine the level of opponents as well as the severity of the “Fortunes”, and likewise the value of the rewards. Only in Hard can players get Ranked, and with it the chance at extra bonus rewards. Players will take on a series of 10 AI controlled opponents, pulled from the pool of fellow players much like the Arena. With each opponent defeated, players will face a new one, with each successive challenger having higher Might than the last. 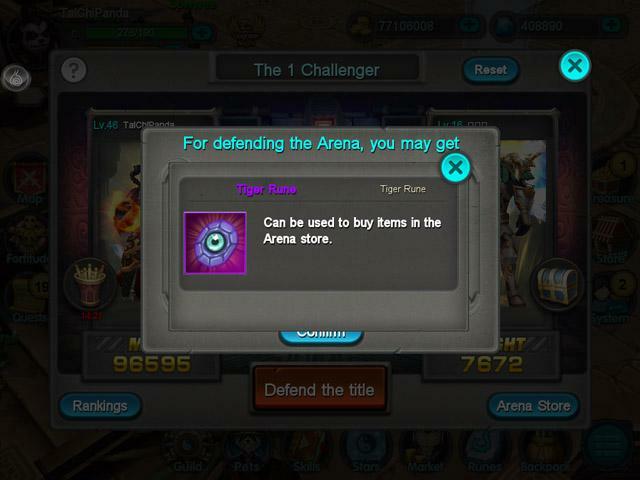 For your accomplishments, you’ll get Tiger Ruins, which can be exchanged at the Decathlon Store. A.	Decathlon explanation and tips. B. Shows what Rank opponent you are about to face in your current Decathlon run (1-10). C.	Resets your current Decathlon run. D.	Shows your current fortune - we’ll cover this in more detail. E.	Your remaining HP %. F.	Shows the possible rewards for your current Decathlon run. G.	Brings up the Decathlon Leaderboards. H.	Starts your next Decathlon battle! I. Brings up the Decathlon Store. 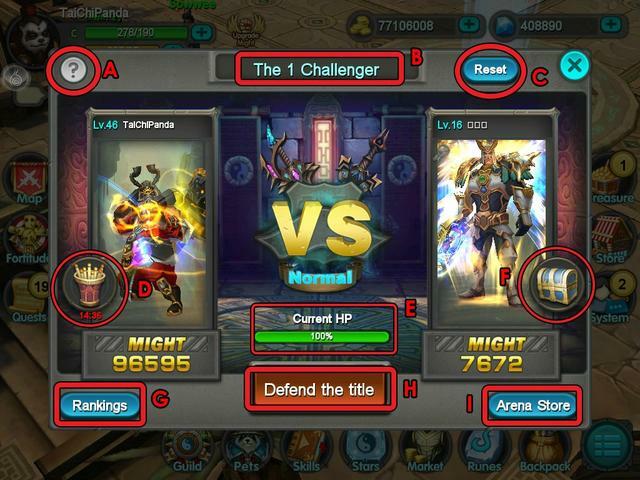 In this menu, you can see your opponent, and also what to expect from the fight. 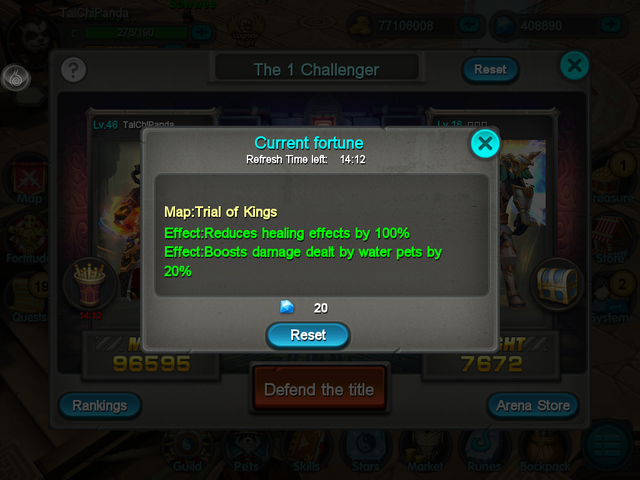 Before starting a battle, make sure to check your current fortune (D) - it shows the map you’ll be fighting on, and which random effects – known as Fortunes – will occur in your next battle. You can also see yoru expected reward, and your remaining HP for the round. Your health and that of the pets that you used will not recover after each successive battle. It will be the same as when it ended. 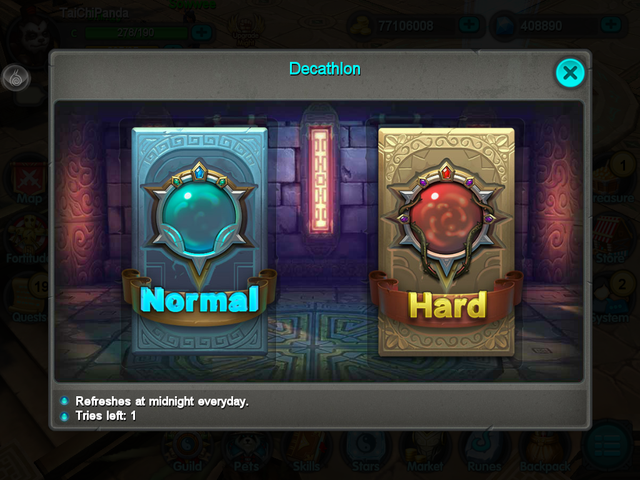 Taking a pet out of action also won’t help it recover – the 10 battle set for Decathlon has no regens. 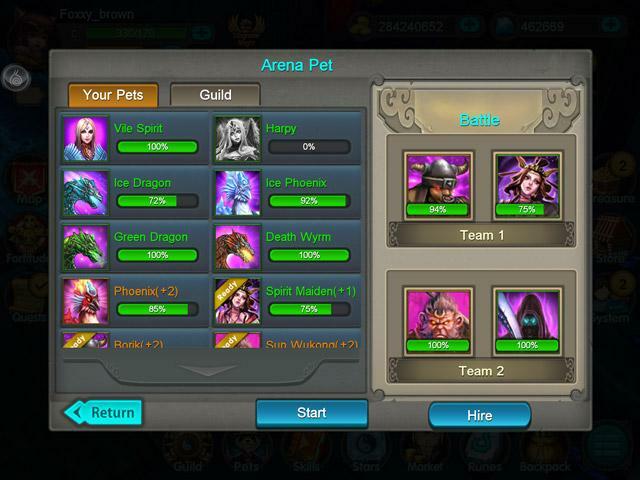 Besides the pets you have, there is also the option to hire out pets from members of your Guild. 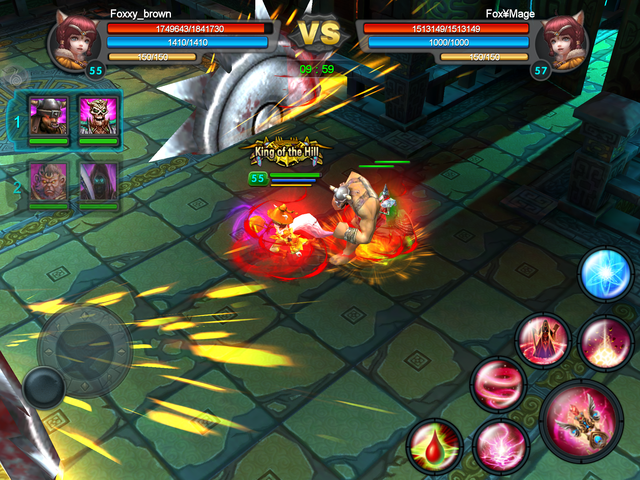 During the battle, there will be randomly generated effects to contend with. These can work to your benefit, or to your detriment, so be aware of what they are. You can reroll to get a different fortune with Diamonds. The more you level up, it’s easy to forget how much damage your pets take for you, and how important they are in battle. It’s very important to make sure that you manage your pets well so they can see you through to the end. Look for good combinations of pets that will help you maximize damage output while minimizing damage taken, or at help to recover. Every pet has their advantage, find ways to maximize them. For example, when upgraded to the right level, Nezha can revive himself after death. Use this as a way to keep him in the game. Tied very closely to the first point, it is very important that you manage both your health and that of your pets. If a particular pet that is important to your gameplay strategy is taking damage, be sure to switch quickly to another to avoid suffering too much damage. Likewise, be aware of how much health you have. If you find you’re taking too much damage, find a way to use your pets or the environment to your advantage. This can be important – if you lose a given battle, it will not automatically end the Decathlon. While it will have an effect on your place in the rankings, after dying players and their pets will have the same health as before they entered. This means they can try again, better informed about what they face. If a battle doesn’t go your way, and you lose too much health or a valuable pet, it can be a smart strategy to let yourself die and start again, with a new pets and tactics. This Guide was produced in coordination with Solbash Gaming as part of the Taichi Mastermind program. 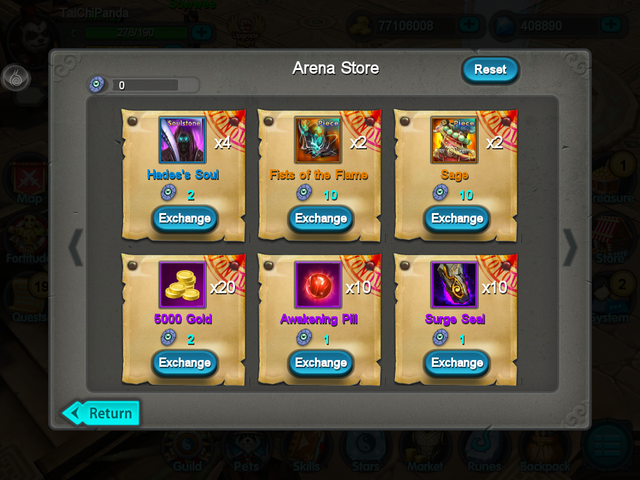 Thanks for this pal, I'm from ASIA server of Taichi Panda and I would like to ask what are those Fist of Flame, Sage, Awakening Pill and Surge Seal. We are still not updated to your current version of Taichi Panda and would just like to get a heads up about this. Awakening pills can be used to increase certain stats of your pets, but this option is locked until you reach lvl 42. You will get a random skill and you can add that one or discard it in exchange for XP (necessary to upgrade your skills). You unlock more awakened skill slots as you level up more. I have a question. I am doing the Decathlon Arena every day. But I have never managed to become of the top5 players in the arena ranking. If I click on the top 3 players I can clearly see that the best players of my server are leading, EXCEPT one player who is top1 since a few days. This player does not only have a low lvl character but also quite weak pets (compared to me and the others). Though he is still leading the arena ranking board. He had beaten the Arena (Decathlon) in less than 3 minutes. How is that possible? I am lvl 63 now, all of my pets are evolutioned at least at level 5 (Borik 6, Boxer 9, Hades 5, Hades 6) and still I can't manage to finish the Decathlon under 3 minutes. How comes? How can someone who is clearly weaker than me finish the Decathlon much faster and more efficiant than someone with at least 50k Might more? Much appreciation for you answers. Can someone help me please? I want to reset decathlon in normal mode but it says that i have to be Vip lv. 9 or higher. Is there any other chance to reset it? Because i have less hp and im dying always. Hakan77 wrote: Can someone help me please? I want to reset decathlon in normal mode but it says that i have to be Vip lv. 9 or higher. Is there any other chance to reset it? Because i have less hp and im dying always. My Gunslinger is 43 now but even at level the decathlon has been making him fight level 48s plus in the first fight or higher with a lot more might then my toon. Why doesn't the system match them closer to level and might. My treasure hunter was who is 63 now was fighting against level 40 when she first started decathlon.